The Lovely Engagement Ring is a delicately accented halo design. This beautiful ring is crafted with a Round Cut center stone with hidden accent stones beneath the halo and trailing down the band. Starting price is for setting only. This ring is a two piece casting, meaning no matter what size center stone is set, the halo will not grow or shrink. This ring matches perfectly with the Lovely Wedding Band; purchase the wedding set for a discount off the band. Metal Weight: 2.9gr. Band Width: 1.5mm.Side Stone Carat Weight: 0.51ctw. Joseph N. Reviewed by Joseph N.
Linley was fantastic to work with! We saw her over a year ago when we went ring shopping and she remembered me a year later! Very responsive and helpful guiding me through the process and helping me make the best choices -- no salesy mentality at all, just great customer service! 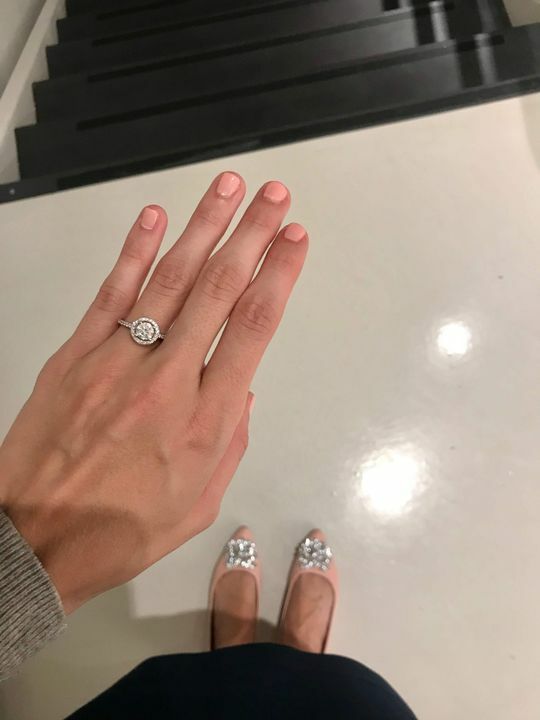 I would highly recommend MiaDonna to anyone looking for a beautiful engagement ring and a great customer experience, not to mention social impact!